The Sheldon Jackson Museum’s August Artifact of the Month is a Tlingit, twined, spruce root basket (SJ-I-A-363). 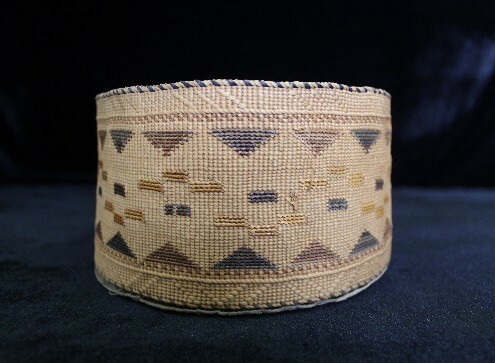 According to museum records and historic photographs, the basket was used as a collection plate in the Tlingit Presbyterian Church of Sitka and donated by the church when it closed in 1956. The Sheldon Jackson Museum is home to over three hundred spruce root baskets. The July Artifact of the Month will be on exhibit until July 31st. Visitors may see these artifacts and other examples of spruce root basketry in the collection at the museum during operating hours - Tuesday through Saturday between 9am and 4:30pm. General admission is $7, $6 for seniors, and free for those 18 and under or members of either the Friends of the Sheldon Jackson Museum or Friends of the Alaska State Museum. Kan. Sergei. Memory Eternal: Tlingit Culture and Russian Orthodox Christianity through Two Centuries. Seattle, University of Washington Press, 1999. [i] Kan, Sergei, p. 230. [ii] For more on the decline of Tlingit membership in the Presbyterian Church and the turn towards Russian Orthodoxy in the late 19th and early to mid-20th century, see chapter Waashdan Kwaan Rule, 1867-85 in Memory Eternal: Tlingit Culture and Russian Orthodox Christianity through Two Centuries by Sergei Kan.